Eagle's Nest Blog: While the cat's away! Last week I went to Carmel in George for a week and it is so good to know that the school continues without any hitches. Thank you God for your hand in everything! 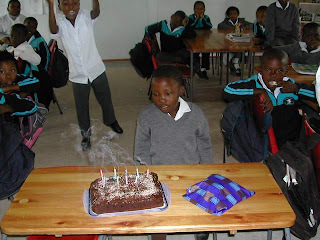 Ziyanda, in Grade 3, celebrated her birthday on Monday 2nd March. Her actual birthdate is 29th Feb. She has grown so much and is doing brilliantly at school! !